Velvet Tip Eyeliner is a precise change in eye makeup. Its brush-like, easy-to-apply pen tip delivers the perfect amount of eyeliner, creating the exact line you want. Flawlessly form a fine, subtle line or fill in a thick, bold look for a night on the town. Unlike other liquid eyeliners, smudging isn’t a problem with Velvet. Its quick-drying formula stays put, then it washes off easily at the end of the day. No need to scrub the delicate skin around your eyes. Simply use some gentle makeup remover, or even soap and water. This is welcome news for any woman who has ever dabbled (or struggled) with liquid eyeliner. Applicators are often rough and uncomfortable on sensitive skin, all while leaving poor coverage and uneven lines. Founders Jayme and Angela Parro discovered Migi Cosmetics in Japan, where it has been popular for many years. They brought this smooth, smudge-proof solution to the U.S. so now you can enjoy eyeliner that looks fabulous while it’s on, but is also easy to take off. Hi everyone! It's a pleasure being on the Grommet with you today. Our Velvet Tip eyeliners truly are a revolution in make-up. I'm here to answer any questions you have! Can this product be used on the inner lid of the eye? @Catherine Yes, you can use Velvet Eyeliner on the inner lid of the eye. It does however have a much longer lasting power when applied to the outer lid. Hi, Angela, I have hay fever allergies and my eyes tend to water. Will this stay in place under those circumstances? @Peggy The beauty of this eyeliner is that it is smudge proof. It will stay on even if you wear it swimming or if you shed tears. However, be sure to dab your eyes dry rather than wiping them dry. It is the wiping motion with water that will remove the eyeliner when you are ready to take it off for the day. @Anna Mariel Never mind I answered my own question. I'm in search for a waterproof eyeliner that works and won't break the bank. I've tried I think 50 kinds and I haven't found one I liked. So I will try this since it says on the website that it is smudge proof, stay-put, waterproof formula. @Anna Mariel Our eyeliner is a water-based eyeliner, which means it is also easily removed with water. However, it has a long, lasting staying power for all day use. As mentioned above, using a wiping motion with your regular make-up remover or water will remove the eyeliner when you wish to take it off. @Karen The formula and tip were developed in Japan, the eyeliner is manufactured in China and we are a 100% US owned and based company. Is it tested on animals? What are the ingredients? @Brandy Is this tested on animals? @PATRICIA No, this product is not tested on animals. Would you list the ingredients in Velvet eyeliner? The color listed as "Navy Blue" looks more like a royal blue. Is the color "Navy Blue" actually a dark blue or a lighter royal blue? @Sue Yes, the blue is probably closer to a royal blue. @Jennifer nevermind the question... just read entire string and found the answer!! Hi there... this looks like a great product! I have had problems in the past with non-smudge eyeliner causing my eyes to feel as though something is in them--a hair, etc. I suppose I'm allergic to them. Is your product hypoallergenic? Hi Deborah, thanks for the kind words. In an effort to not provide misleading information, I will double-check with Angela about this. Please take a look at the list of ingredients that were posted earlier to make sure there is nothing you are allergic to. 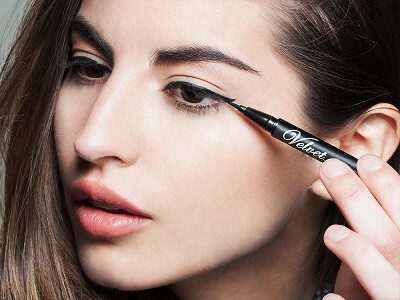 However, most customers that have had issues with cosmetics in the past have found great relief using Velvet eyeliner. @Angela Thanks, Angela! Not quite sure what it was I've been allergic to before, but I'm sure it was something relatively common to others, as well, so if they've been happy with your product, I'm sure I would be too! Would love to try this product. How does it fare with eyes that tend to water? Will tearing a bit cause it to run? Hi Skye, as Angela mentioned above, tearing will not cause it to come off. However, when drying your eyes it is important to dab not wipe as the wiping motion with water will remove it. @Mike Any idea if the product is hypoallergenic, Mike? I recently read reviews of this product on other sites that complained about receiving product that had dried up and would not work. Also, some people commented on the product flaking. What feedback, if any, have you received on these two issues? I'd like to try it, but I have some reservations should I encounter any problems. What is your return policy? Hi Nancy, I have talked with the ladies here at The Grommet who tested the product and they did not find any issues with the product flaking. However, if you find the product has dried up or you are unsatisfied with it, you can find our return policy here. @Mike Thanks for the quick response. I have used many smudge proof eye liners. I still get raccoon eyes. Why is your product different? @Janet I'm one of the testers at Grommet and also prone to raccoon eyes. I don't know if I just rub my eyes unconsciously or what... Anyway I've been happy with Velvet after a couple months of use and alternating it with another product. I'm wearing Velvet today in fact and 14 hours into my day it is perfectly intact, no smudges or randomness. I'll let Angela address further but one other thing I will add is that after travelling to Japan 5 times since last year I have realized that Japanese companies really excel at beauty and skin care....just looking at the women there is overwhelming proof and we've brought over a few favorites like Velvet..
@[email protected] I find that many woman will shower and wash up for the day, then apply moisturizers and then apply their make-up. It is always best to completely dry your face and especially the eye area before applying liquid eyeliner. This will greatly help with avoiding this problem. However, with Velvet eyeliner you will find that the formula had been designed specifically to avoid smudging and smearing. Therefore, this will become a problem of the past for you! I would like to try the brown eyeliner but it doesn't come up as a choice. Is it available? @Ruth Brown is definitely an option. Is it not displaying in the option section? @Angela The only options I have on my computer are royal blue and charcoal. Neither Brown nor Black are options...Of course, the two I would like are brown and black. ha! Wish they came in black. Hi Kathy and Angela, my guess is the brown and black colors have sold out. Given everyone's interest on the board, I can't say that I am shocked. If you want to get an idea of when those colors will be restocked you can contact our customer experience team here. @[email protected]@[email protected] The Velvet eyeliner colors that were launched today included Navy Blue, Green, Brown, Black and Charcoal Grey. As Mike had mentioned above there had been a huge interest. 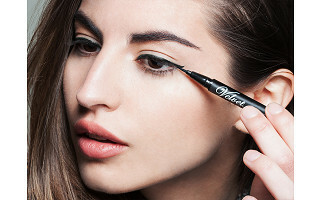 Velvet Tip Eyeliner is a precise change in eye makeup. Its brush-like, easy-to-apply pen tip delivers the perfect amount of eyeliner, creating the exact line you want. Flawlessly form a fine, subtle line or fill in a thick, bold look for a night on the town. Unlike other liquid eyeliners, smudging isn’t a problem with Velvet. Its quick-drying formula stays put, then it washes off easily at the end of the day. No need to scrub the delicate skin around your eyes. Simply use some gentle makeup remover, or even soap and water. This is welcome news for any woman who has ever dabbled (or struggled) with liquid eyeliner. Applicators are often rough and uncomfortable on sensitive skin, all while leaving poor coverage and uneven lines.